This is the most high performance Spider ever built by the Prancing Horse and is powered by the 488 coupé’s 3902cc turbo-charged V8 which punches out a maximum of 670 CV with the Variable Torque Management system guaranteeing smooth, progressive torque delivery in the higher gears up to a maximum of 760 Nm at 3,000 rpm. This is an astonishingly sporty car with blistering acceleration (0 to 100 km/h in 3 seconds and 0 to 200 km/h in 8.7) and, even more significantly, a razor-sharp throttle response time of just 0.8 seconds which essentially eliminates the turbo lag typical of this kind of engine. The Scaglietti centre of excellence’s aluminium crafting skills have also produced a light, high performance spaceframe chassis made of 11 different 6000 series aluminium alloys containing varying percentages of magnesium and with specific characteristics to meet the demands of the different areas of application. 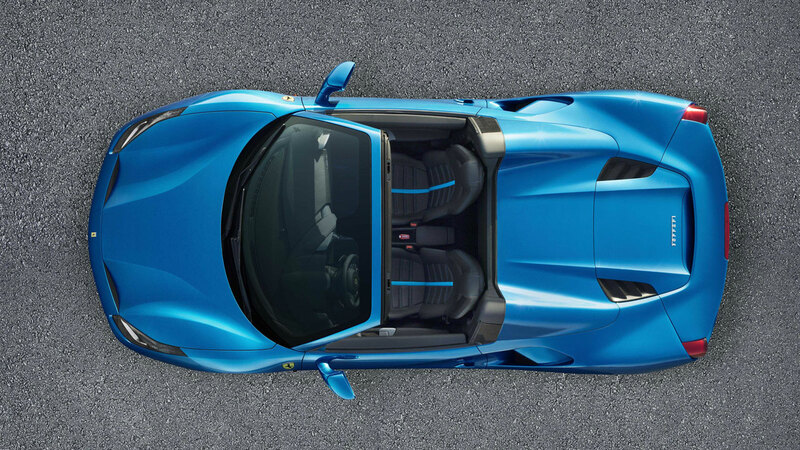 Extraordinarily, this yields the same torsional rigidity and beam stiffness figures as the coupé, in which the roof is a structural element, improving the chassis’ performance by 23 per cent over that of the 458 Spider. 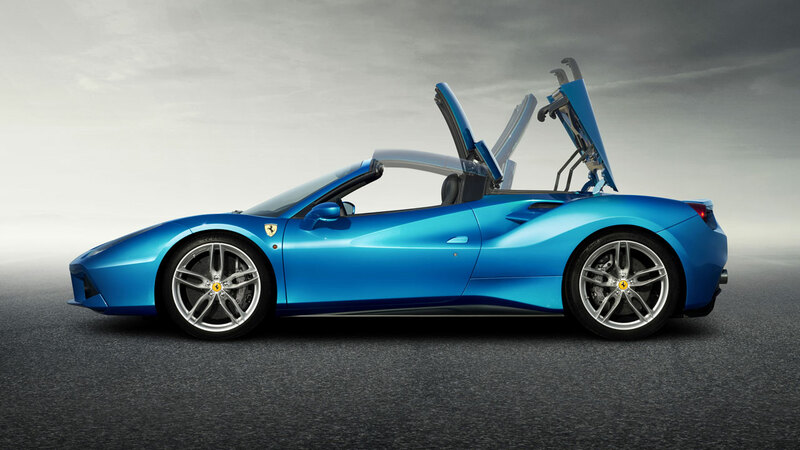 The 488 Spider uses the RHT (Retractable Hard Top) which debuted on the 458 Spider as world-first for such a solution on a mid-rear engined car. The RHT has rendered traditional soft-tops obsolete as it is not only lighter (- 25 kg) but also provides better protection from noise and elements even when lowered courtesy of a glass wind-stop adjustable to three different positions. Equally significant is the fact that the RHT can be raised or lowered in 14 seconds even when the car is moving. The car’s mechanical set-up and dynamic vehicle controls make a pivotal contribution to its powerfully sporty behaviour on the road with Manettino settings chosen for its mission. Specifically, the technicians worked on the magnetorheological dampers to guarantee maximum sportiness without compromising on comfort. The new SSC2 Side Slip Angle Control system also makes it easier for non-professional drivers to drive on the limit. 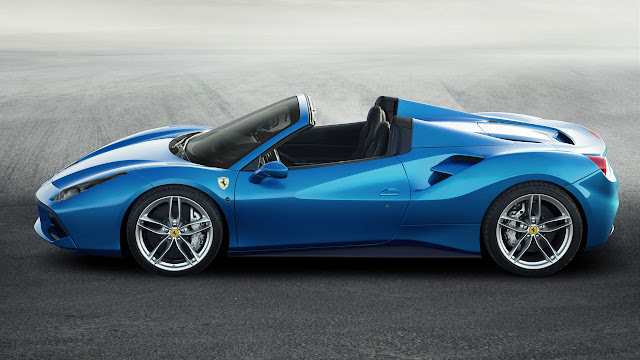 Additionally, to ensure superb fun behind the wheel on more challenging routes, the 488 Spider responds virtually instantaneously to steering wheel inputs (0.06 seconds – 9 per cent faster than the previous Spider). The hard-working Ferrari Styling Centre has also brought a sculptural beauty to the modifications made to accommodate the RHT and meet the aerodynamic demands of the car. Cases in point are the flying buttresses which optimally channel air flows to the engine cover, the ribbing on the engine cover and the air intakes with sculpted mesh grilles which lend that area of the car a sense of incredible dynamism. 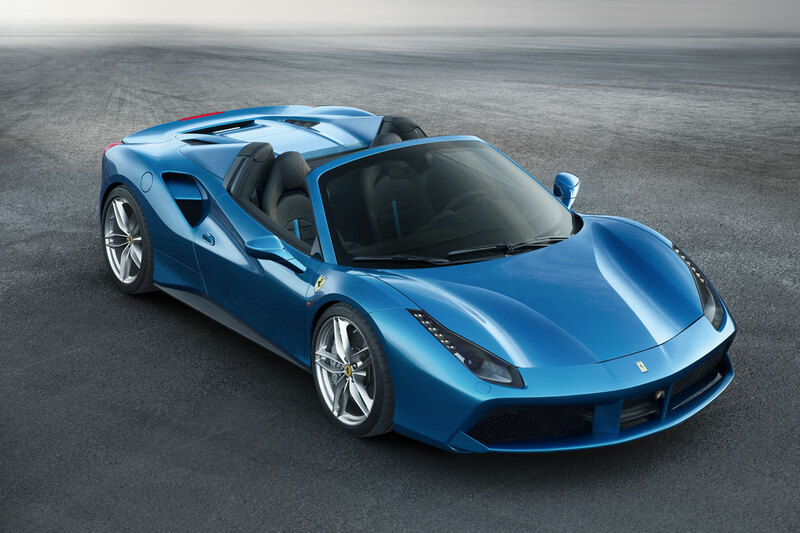 The 488 Spider also debuts a new colour designed to enhance its forms. The Blu Corsa livery almost seems to meld with the sky overhead, in fact, and metallic particles suspended in the paint give the bodywork a gloss that underscores its sculptural volumes. Its unusual iridescent effect is created by the two-layer paintwork. In line with Ferrari tradition and drawing on the harmonics typical of Prancing Horse cars with this kind of architecture, this 8-cylinder has its own absolutely distinctive soundtrack, thanks to exhaust headers with longer, equal-length piping and the flat-plane crankshaft. The sound was crafted to be seductive but never invasive when the top is dropped, with both volume and clarity increasing in signature Ferrari fashion as the engine instantly responds to the accelerator pedal and revs rise, underscoring the car’s performance. Frankfurt also provides the venue for another major announcement: the extension of the Apple CarPlay system to the entire Ferrari range. The FF was the first car in the world to adopt the innovative Apple system which offers instant and intuitive voice and touch functionalities: everything from phone calls to map use, messaging and music. 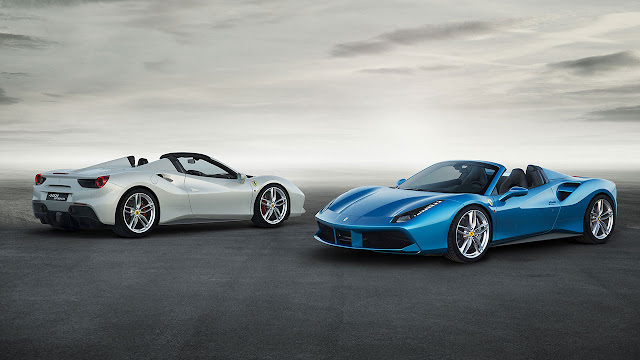 The FF was quickly followed by the California T. The Apple CarPlay will also soon be available for the sportier, more aggressive Prancing Horse models - the 488 GTB, the 488 Spider and the F12berlinetta - on which it is premeried at the German Show. Sticking with the sporty theme, there are also two Tailor Made California Ts on the Ferrari stand at Frankfurt. The first has a very modern allure thanks to glossy Grigio Titanio bodywork, an Antracite top and black leather and Blu Microprestige technical fabric interior trim, with the colours of the latter also picked up in the grille and brake callipers. The second California T clearly references Ferrari’s sporting heritage with a modern take on the famous 1957 250 TR which won three Sport Prototype world titles and is now considered one of the world’s most desirable cars by collectors. This particular California T has Piano Black bodywork with sporty red and white detailing on the front wheel bumpers and a matte Grigio Ferro Met grille. It also features unusual aerographed shields on its flanks. The livery colours are mirrored in the cabin which mixes black leather with extensive Rosso Cremisi, exactly as per the classic track car. The boot is lined in Alcantara and carbon-fibre as befits a Ferrari designed to epitomise the marque’s sporty DNA. Also at the German Show are a coupé version of the 488 in Bianco Italia with Blu Sterling interior, and, of course, the 12-cylinders in the range: the four-seater, four-wheel drive FF in an elegant Grigio Silverstone livery with Tortora cabin trim and the F12berlinetta in Rosso Corsa with a classic beige leather interior to underscore its roots in the purest Ferrari tradition.